I just happened to have a £50 note in my hand the other day. It was a Clydesdale Bank issue and because women on bank notes has been in the news in recent times I took particular note and was surprised to find that it is a women – and a redoubtable one at that. 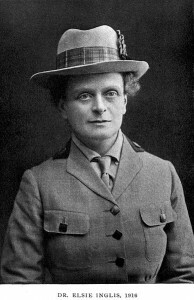 Elsie Maud Inglis was born in India in 1864 to John Forbes, a civil servant. Her father retired when she was 14 and they returned to Edinburgh. Her mother died in 1885 and it is suggested that this played a part in her deciding to become a doctor. Her parents believed that their daughters had the same right to an education as their sons and so she entered the Edinburgh School of Medicine for Women. That of itself was an incredible achievement however she went on to found her own maternity hospital, entirely staffed by women. She was appalled by the general standard of care and lack of specialisation in the needs of female patients She was an active suffragette and helped establish, in 1906, the The Scottish Women’s Suffrage Federation. However with the onset of the war, her focus was entirely on setting up women’s medical units on the Western Front. While the British were not keen on supporting her efforts the French took a very different stance and were grateful for her help. She was also responsible for sending women’s units out to several fronts and she herself was active in Serbia from 1915. She was captured and sent home but immediately returned to raising money to send women to the Russian front. In fact she led a team in 1916 in Odessa until she had to return home a year later as she had cancer. She died on 26 November 1917 and her funeral service was held in St Giles Cathedral in Edinburgh. Winston Churchill said of Inglis and her nurses “they will shine in history”. She was the first woman to be awarded the Order of the White Eagle (V class) by the Crown Prince of Serbia at a ceremony in London in 2016. A memorial fountain was erected in her memory in Mladenovac, Serbia, commemorating her work for the country. She is remembered there for improving hygiene that reduced typhus and other epidemics that had been raging there in Serbia. There is also a memorial to her in St Giles Cathedral and a plaque in Walker Street, Edinburgh marks her pre-surgery work. Thanks to the Clydesdale Bank for bringing this remarkable woman to my attention. Elsie Maud Inglis was nominated by Annie Casey.